Provinces, SANA –The Army on Saturday carried out successful operations against armed terrorist groups in many areas across the country, killing a number of terrorists and injuring others. Army units carried out a string of accurate operations against terrorists’ dens and gatherings in eastern Ghouta and several towns and villages in Damascus countryside. Numbers of terrorists, some affiliated to the so-called “Islam Army” were killed and wounded during the operations and dens for terrorists were razed to the ground. SANA field reporter said army units destroyed terrorists’ hideouts with the weapons and ammunitions inside in several areas in Joubar neighborhood, killing and wounding several terrorists. Army units pounded a concentration for terrorists in al-Masroub neighborhood in Harasta, killing terrorists and wounding others. Army units killed and wounded all members of an armed terrorist group in Alia farms in Douma area and destroyed weapons and ammunition. Mohammad al-Tillawi and Huzaifa Khaiti were identified among the dead terrorists. A den for a terrorist group from the so-called “Islam Army” with the terrorists inside was destroyed in al-Shifouniyeh farms, according to SANA reporter. Meanwhile, an army unit carried out an accurate operation in the farms of Zabdin town, killing many Islam Army terrorists who tried to sneak into al-Maliha town, among them Yassin al-Shaikh Mohey-Eddin, Deeb Jamous, Sulaiman al-Sheikh, Hassan al-Wawi and Adnan Karkar. A terrorist group was wiped out in the farms of al-Nashabiyah deep into eastern Ghouta. In Qalamoun mountainous region, an army unit carries out several operations in the towns of Al-Masherfeh, al-Jubbeh and Essal al-Ward where weapons and ammunitions were destroyed. Terrorists were killed near Okbat al-Fasakh to the east of Tallet Moussa northwest of Ras al-Maarra town and several terrorists who attempted to sneak across illegal routes into the area got killed. 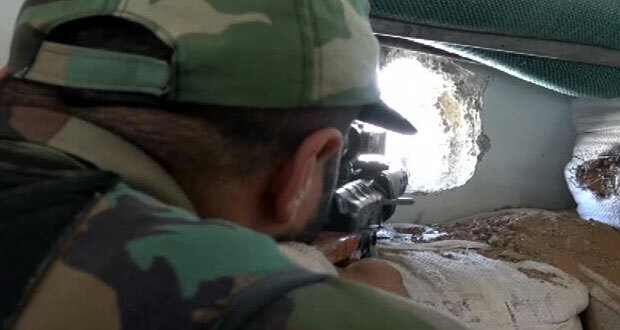 An army unit resulted in destroying machineguns and various types of ammos, with terrorists getting killed and wounded in al-Mahatta neighborhood in Zabadani, as terrorists were simultaneously killed and others wounded southeast of Sayyeda Sukaina shrine in Daraya city. The army regained control over Ayash and Ain al-Bou Jimaa villages in Deir Ezzor western countryside. A source in Deir Ezzor told SANA that units of Army regained full control over Ayash and al-Bou Jimaa villages. 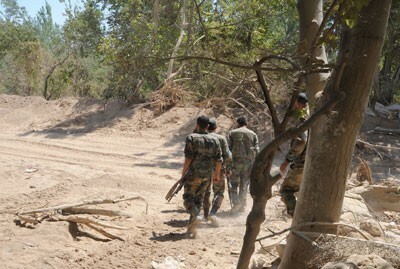 A source in Deir Ezzor province told SANA that an army unit foiled an attempt by terrorists to infiltrate into al-Hwaika neighborhood in the city, killing 17 terrorists, among them non-Syrians, and destroying their ordnance. Two 37mm cannons were destroyed as confrontations raged between army units and armed terrorist groups in al-Rushdieh neighborhood that resulted in killing Khalaf al-Harbi, a Saudi terrorist. 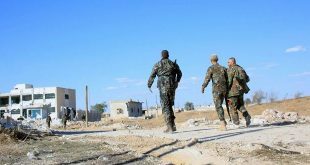 In Aleppo and its countryside, units of the armed forces continued their operations against the terrorists’ gatherings and their dens in a number of the neighborhoods, inflicting heavy losses upon them. A military source told SANA that army units also attacked a den of the terrorists in al-Haydaria, Blat, al-Kafour, Khawabi al-Asal, to the west of Icarda , Kafar Naha, al-Samiria, Handarat and Hritan in Aleppo and its countryside as a number of the terrorists were killed and others were injured while a number of their vehicles were demolished. The source added that an army unit also destroyed a number of the terrorists’ vehicles in al-Atareb. In Daraa Countryside, army units targeted the gatherings of terrorists in several areas as a number of them were killed and others were injured while a number of their vehicles were destroyed. A number of the terrorists were also eliminated by the army units in Tafas Town, near the footbridge in al-Nu’aima Town, to the south of Mzaerib Town and in al-Tayba Town while a number of their vehicles were demolished in Daraa Countryside. Units of the armed forces also killed and wounded a number of the terrorists in Enkhil, Ebta’a, on al-Yadouda Crossroads, in Attaman Town, Qatlish Farm, to the north of Tal Khudir in Da’ail Town and in al-Kassara area on Zimrin Crossroads in Daraa Countryside. A military source said army units killed terrorists and wounded others during operations against their gatherings in al-Tibah town and the area surrounding the cables’ building in Attaman town in Daraa countryside and near Bir Um al-Daraj in Daraa al-Balad. A military source said the army targeted terrorists’ gatherings and hideouts in the areas of Tal al-Khudr, Koum Touman, al-Sheikh Saad, Inkhel, al-Hrak and in Daraa al-Balad, killing and injuring scores of terrorists and destroying their weaponry. An army unit foiled armed terrorist groups’ infiltration attempts to the northeast of Tal Abu al-Sanasel and on Jabbourin-Um Sharshouh junction in Homs countryside, killing and injuring a number of terrorists. The units of the armed forces also targeted terrorists’ gatherings in Bait al-Kibrit neighborhood in al-Rastan and al-Naseriyeh neighborhood in Taldao and in al-Farhaniyeh village and in Um Sharshouh in Homs countryside, killing and injuring a number of terrorists. May terrorists were killed and wounded during army operations in al-Rastan, al-Farhaniyeh and Um Sharshouh in Homs countryside. In Hama, a source said that army units continued operations in several areas in Morek town in Hama northern countryside, tightening control over several building blocks after eliminating entire terrorist groups in the southern area of the town. In Quneitra Countryside, a military source said that an army unit has thwarted an attempt of 40 terrorists to sneak from Hersh Tanja to Dahr al-Kassar in Quneitra countryside, killing most of them. The source added that army units killed terrorists and wounded others in the towns of Ofania and Abu Shatta, and on the road to Um Batena and al-Ajraf, also in Quneitra countryside. Army units wiped out terrorists in Tal Jabba and in al-Samdaniyah al-Sharqiyah village, while heavy losses were inflicted on members of an armed terrorist group in Rasm al-Halabi village and the areas surrounding it. A military source told SANA that army units eliminated all members of an armed terrorist group, most of them non-Syrians, near Era al-Shamali village in al-Rouj plain in Idleb countryside and destroyed terrorists’ vehicles with all the terrorists inside them. The source added that army units targeted terrorists’ gatherings in Kafer Najed, Kafer Lata, nahliyeh, Binnish, Jarjanas and Qaminas in Idleb countryside, killing a number of terrorists and injuring others. A military source told SANA that an army unit killed terrorists and wounded others near Meshmeshan and al-Kastan villages in Jisr al-Shughour in Idleb countryside, destroying several cars laden with heavy machineguns.